Kids Eating Healthy. Energize their Lives with Nutrition. Is it an ongoing battle for you to get your kids eating healthy? Here are some suggestions that help incorporate nutritious foods for health and weight prevention. 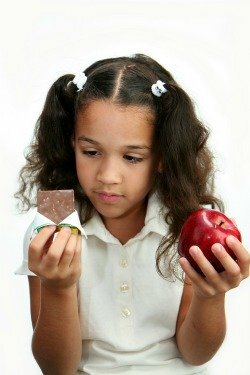 One of the biggest problems is that children don’t realize that food and nutrition are not the same things. They are connected, but there are many foods that provide pleasure and satisfy hunger but provide no real nutrition. Of course children don’t understand the health consequences that go along with stuffing are mouths with anything we want, anytime we want. In my generation we ate whatever my mother put on our plates. Good nutritious food with no arguments. But times have changed. An endless variety of processed foods, more fast food joints and amazing marketing techniques have made it almost impossible for parents to get their kids to eat nutritious foods. Getting kids to eat healthy is becoming more and more of a challenge and we are now seeing the consequences. Hyperactivity, bad behavior, learning difficulties, headaches, childhood obesity, diabetes and in some cases symptoms of ADD/ADHD (Attention Deficit Disorder/Attention Deficit Hyperactivity Disorder). These of course are not all the symptoms of a bad diet, there are many more. Children do learn and imitate the behavior of their parents. So if you are eating nutritious meals and snacks, the kids will probably want to as well. This way you won’t have to prepare different meals for the kids. 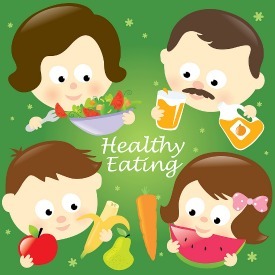 The whole family can enjoy the same nutritious foods. Parents eating healthy helps kids eating healthy. What is the first thing kids do when they crave a snack? They start ransacking the cupboards and the fridge to find something that will satisfy their hunger. But if there were no chips or cookies to be found, they would have no choice but to choose something else. Imagine a bowl of fresh fruit on the counter, washed and ready to be eaten. A veggie platter prepared in the fridge with some dressing or dip on the side. If they are really hungry they may just reach out for that apple instead. Studies have shown that when kids are included in meal preparation, such as shopping, planning, and how foods are prepared they are more excited to eat what is on their plate because they were a part of the process. When you are grocery shopping, teach them about food and nutrition. Explain where fruits, vegetables, grains, dairy and proteins come from. Perhaps creating a scrapbook can be another fun idea. Enjoy a night of cutting out pictures from magazines of healthy foods they like. They can paste the pictures in the book and can list what they like about that food and why it is good for them. What about a recipe section in the scrapbook? You can encourage your child to invent new snacks or meals for the whole family. Imagine the knowledge and confidence they could achieve if being more involved. If everyone’s schedule allows, try to get the whole family to sit down during supper time. Make sure the television is off and that everyone is focused on each other. Children will learn that meal times can be fun. Now keep in mind that not all of the following suggestions may apply to you depending on the age of your children. Also, every child is different, so you may have to experiment with a few of these ideas. We have just started this section and have many more great additions coming soon. What a nice change from fast food or certain sandwich selections which have become boring or all too familiar. This makes a fun quick meal which offers bite sized balls of tasty protein, veggies and dip. This hearty meal offers a little bit of everything to help the kids eating healthy. This recipe takes the pressure off when the young ones are calling out for a yummy and fast meal. This recipe cooks the meat crispy on the outside but juicy on the inside with no deep frying required. This recipe is easy to make and quick to please. They don't have to know they're eating a bowl full of nutrition and antioxidants. Making lunches nutritious, fast and fun.